Sources: Dr. Craig Miner, The Wichita State University; "Wichita Century" by R.L. Long. LearJet, Cessna and Raytheon all located here. There are events ocurring throughout the year here in Wichita. One of the largest has been the Wichtia River Festival. There are fun things to do and excitement throughout this affair. 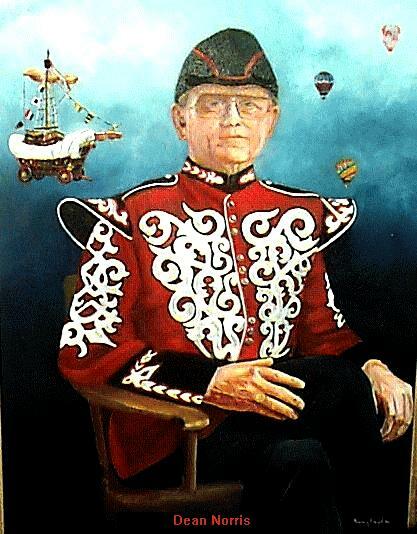 I was fortunate enough to be commissioned by Stephanie Norris to do a portrait of her father, Dean Norris, who was voted to be WindWagon Smith one year. The painting is shown below. There is a story about the WindWagon and WindWagon Smith. (click on link above to read) The Home Page of the River Fesitival will tell you some of the things that go on during this time and some of the history behind the Wichita River Festival. 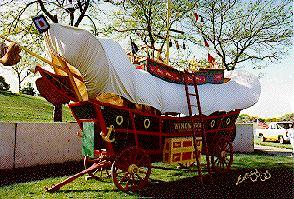 The Picture below is a photo of the actual WindWagon that is used in the celebration. I painted it above and to the left in the painting. Hot air balloons are also a big part of this weeklong celebration, so I felt they too needed a place in this protrait.